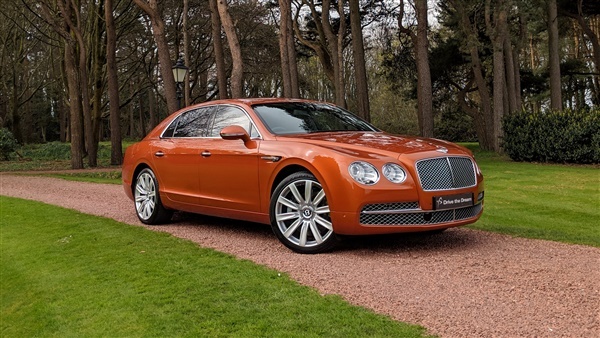 New in stock we have a stunning Bentley Flying Spur W12. Ordered and specified new from Jack Barclay this is a 2016 Model Year car and is very special with a superb list of cost options. Offered in Orange Flame with Beluga Black leather this car comes with a great level of factory ordered optional equipment including but not limited to Rear Entertainment, Adaptive cruise control, Embroidered Bentley emblems, Hand cross stitching, Hand stitching to steering wheel in contrasting colour, Bright boot finisher, Bright chromed lower bumper matrix style grille, Jewel fuel and oil filler caps, Privacy glass to rear screen and rear side windows, Steering column mounted gear selectors, Storage case to centre console, Chrome inlay to door waist rails, Drilled alloy sports foot pedals, Knurled sports gear lever, Piano Black, Sports, single tone 3 spoke hide trimmed steering wheel, Naim for Bentley, Rear view camera, 21 inch 10 spoke polished Propeller alloys, Space saving spare wheel 23000 miles with Bentley main agent service record. Please register early interest.